Q. What is Scalp Micropigmentation? A. Scalp Micropigmentation (also know as a hair tattoo, hair pigmentation or SMP for short) is a form of cosmetic tattooing typically for balding men that gives the realistic appearance of hair follicles. Q. Does SMP look real? A. SMP, when done by an experienced practitioner, gives hyper-realistic results. Clients say that even up close in the mirror, they can’t distinguish where their real hair ends and the pigmentation begins. See the results for yourself in person at a free consultation – all of our team have Scalp Micropigmentation treatment done. Q. Is Scalp Micropigmentation permanent? A. Scalp Micropigmentation is classed as a permanent cosmetic treatment. Although the results are permanent, they can fade slightly over the years to a lighter colour. For advice on avoiding premature fading, visit our aftercare instructions. Q. How much is Scalp Micropigmentation? A. Scalp Micropigmentation typically costs between 1,500- 3,000 total for a full treatment including multiple sessions. At Skalp®, a full treatment includes 3 sessions and a 12 month guarantee. You can see a visual price guide on our website here, but we do recommend visiting for a free consultation to get an accurate quote. Q. Can I pay monthly for my treatment? A. Yes. We offer a finance option where you can split your treatment cost into affordable monthly payments, with 0% interest available. For example, a 2,000 treatment can be split into a 12-month payback option at 0% APR costing just 166 a month for 12 months. You can apply for finance here. Q. How long should I expect my treatment sessions to take? A. The human head has an astonishing 2000 follicles per square inch. Not surprising then that it usually takes a minimum of three sessions to achieve the final desired look on a mainly bald head. As part of our diligent, results-focused approach, we apply a lighter pigment during treatment number 1. Session 2 sees us adjust to obtain a perfect match, whilst adding density and the crucial blend into your remaining hair. In session 3 we focus on completing the appearance and adding detail. Q. Is there a Scalp Micropigmentation clinic near me? A. Skalp® have 7 clinics around the world and are still growing. We have SMP clinics in the following cities: London, Manchester, Edinburgh, New York, Los Angeles, Marbella and Tel Aviv. If we do not have a clinic yet in your city, we welcome clients who travel to us from all over the world. Our team are happy to assist you in arranging your appointments to make your travel and treatment convenient for you. Q. How soon can I have the procedure? A. We believe this is a very important decision in your life. Whilst we are very confident you will love the results, in the interest of professionalism we insist on a cooling off period of a minimum of 24hrs between consultation and treatment – to allow you to be committed and prepared. Q. What are the hygiene standards in your clinics? A. Our clinics adhere stringently to the Health Protection Unit’s standards for infection control practices. Sterile medical gloves are used and single-use needles are disposed of immediately after use into sharps containers. Q. What qualifications do your practitioners have? A. All of our practitioners have completed our in house advanced scalp micropigmentation training programme, they also carry full practitioners insurance. 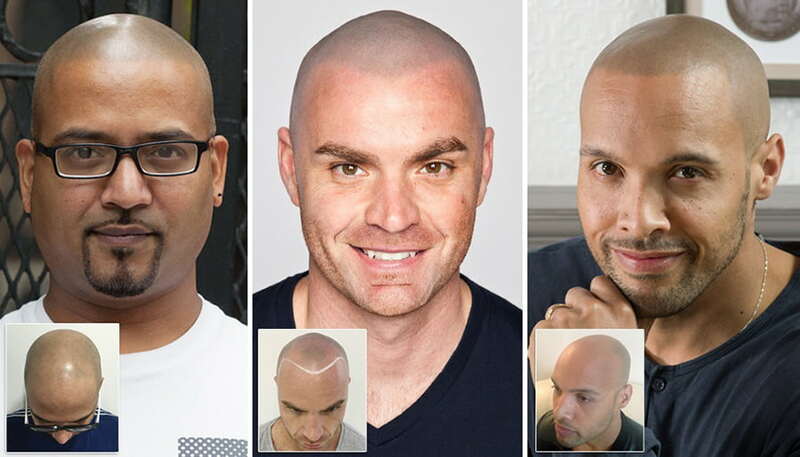 A. Skalp® have been providing Scalp Micropigmentation treatments for over 5 years now so have thousands of reviews. Check out our reviews, gallery and video testimonials from real clients here. You can also check our our 5 star reviews on Google, Trust pilot and Facebook. Q. How will I look after a treatment? A. You can expect to see visible results and even a new hairline instantly. Straight after each session, there may be some redness. Redness on the scalp usually lasts between 24-48 hours after each session. During the healing process, the scalp pigment dots will typically appear darker or larger for up to four weeks- this is normal, as then the pigment softens to its desired colour and natural size. All of our full treatment quotes include 3 sessions. Like in the example below, there is a gradual build-up of coverage, density and colour to get the perfect result. Q. Do I have to shave for Scalp Micropigmentation? A. In most cases, yes. For a standard SMP treatment you will need to shave your hair using hair clippers, facial shaver or a razor. We recommend the best length to shave your hair for your SMP treatment to look natural would be a 0.5-grade length or shorter. Of course, we encourage you to experiment with what shaving routine looks and works best on you. Q. Is Scalp Micropigmentation for long hair? A. Scalp Micropigmentation can work on long hair to give the appearance of thicker hair. A thickening treatment works the same as on a shaved head by mimicking the appearance of hair follicles so that less of the scalp is visible on thinning areas. To ensure a natural result, we would ask that you visit for a consultation so we can assess in person. If there is not enough existing hair for the treatment to blend with, we may advise that you would need to shave. Q. Will Scalp Micropigmentation work with grey hair? A. Yes. Scalp Micropigmentation works well on grey hair, as when any colour hair is shaved short it has a grey tone it already, so it will not make a difference if your hair is already grey or your hair turns grey in the future. Q. How long will my Scalp Micropigmentation last? A. Scalp micropigmentation is a permanent treatment but may fade to a lighter version over the years. Typically, we recommend a touch-up session to freshen up the treatment every 3-6 years. Q. How will my Scalp micropigmentation look after 5 or 10 years? A. After 5 years Scalp Micropigmentation treatment should look a lighter version of how it did when it was first done. If you want to see the treatment on a real person after having it done for years, speak to Skalp to arrange a free consultation – all of the Skalp team have the treatment done, some for 10 years now. Q. I have scars from a Hair Transplant, can Scalp Micropigmentation be used to camouflage them? A. Yes we can camouflage all forms of scarring, Strip/Punch/FUE, so you can wear your hair as short as you like. A. Yes there is a 12 month Guarantee from your first session for full treatments, just in case any areas of the treatment is not perfect, simply give us a call and we will book you in for one extra session at no extra charge, any style or colour changes are chargeable at an hourly rate. Q. I’m nervous about how we design my hairline…. A. We will work with you using a wax pencil to sculpt and craft a hairline that you love. Some clients will want a firmly defined hairline and others prefer soft, jagged, or perhaps even a mature, slightly receding effect. Generally we advise a soft line at the first treatment with adjustments made to reach your perfect hairline during the following treatments. Q. Can Scalp Micropigmentation cause hair loss? A. As Scalp Micropigmentation is non-surgical, like a regular tattoo, it does not affect the hair follicles and can not cause hair loss. Q. I prefer to avoid any pain – can I take a painkiller? A. If you are keen to minimize any pain, we recommend you try paracetamol and/or ibuprofen an hour before treatment. Q. Will the pain continue after the treatment procedure is finished? A. Happily no. The discomfort is only during the actual medical tattoo procedure and it is considered to be discomfort rather than pain. Q. How long do I need between treatments? Initial Consultation: Initial free consultation and patch test if requested. First Session: Lasting between 3-5 hours depending on the complexity of your Micro Pigmentation needs. Second Session: Roughly 1 week after the first, lasting 2-4 hours where the colour is gently perfected and the hairline refined. Third Session: Three to five weeks after the second, lasting 1-3 hours to perfect the shade and hairline for your perfect result. Q. What is the downtime? A. Following the treatment, the treated areas will look slightly red for roughly 24 hours, a lot of our clients can go back to work the very next day. Q. What size is the needle? A. The needle used is a sterile, single-use, 3 point micro needle specifically designed for Scalp Micropigmentation. Q. How flexible can you be about appointment scheduling? A. We understand that you’ll want the treatments to impact your work and family life as little as possible. Many of our clients fly in for treatments so we ensure we are flexible, open late and at weekends, and with a highly effective advance booking system, once you are happy with your dates we ask for a non-refundable deposit of 250 to secure your dates. Q. What if I need to change my dates? A. No problem, if for any reason you need to change your dates just let us know as soon as you can and we’ll find you some new dates as long as you let us know 48 hours before your appointment time, if you cancel your appointment within 48 hours of your appointment time there is a 250 late cancellation fee. Q. Is there a long waiting list? A. We try to be as light on our feet as possible. We know that when the decision has been made, you’ll be keen to get the process underway ASAP (allowing for the cool-off period of course), however our clinics are very busy so expect a minimum of a 2 week notice period depending on the clinic. Q. What age restrictions are there? A. It is a treatment suited to all ages. We have treated clients in their 60s and 70s. At the other end of the scale, we can treat clients as young as 18, no younger I’m afraid for insurance purposes. We’ll make sure you have full verbal and written after-care guidelines, but in reality, after-care is remarkably straightforward. Sweaty exercise is not recommended in the 5 days after treatment nor is shaving or washing the scalp and you’ll need to wear a good sunscreen and avoid chlorinated swimming pools for a month. What about future hair loss? We do not just treat the areas that are already bald, we blend well into your remaining hair so when you lose more hair in the future you won’t even notice. We’ve never had a customer to date want a reversal process however the removal process would be similar to that of a tattoo with the exception that Scalp Micropigmentation is only situated within the 2nd dermal skin layer compared to a conventional tattoo being almost twice as deep. A full reversal could easily be achieved with a laser within two sessions. We can envisage our clients looking to change their look, perhaps soften a hairline or maybe even recede slightly as an individual becomes older. To soften a hairline is possible with only 20 minutes of laser treatment. How much does a touch-up cost? After 3-6 years you may feel the need for a touch-up, maybe to have a slight re-style or you might fancy going a bit darker, touch-ups are charged at an hourly rate which is 300 per hour, a touch-up is usually only one hour long, sometimes two hours depending on the size of the area needing treatment.